One of the many discussions that can be found in performance practice of the Baroque period surrounds the issue of whether composers meant a recorder or flute when they designated a solo part “flauto.” There is, of course, a basic rule of thumb in which the term by itself refers to the former, while the latter usually requires some sort of qualifier, such as “flauto traverso.” If only it were that simple, for the actual transverse instruments could be found in a relatively small number of variants, while the recorders come in virtually all shapes and sizes. Moreover, nomenclature of the time often left the designation ambiguous. Even designated traverso parts were probably frequently played on recorders and vice versa, so in short things were quite spongy from a performance practical standpoint. Thus this group of concertos performed by Maurice Steger on the recorder fit within the instrumental parameters of the Baroque period, even though two of the works, “Il Gardellino” and “La Pastorella,” are in the key of D Major, the preferred one for the traverso. “La Notte” too probably fits the traverso better in terms of range and figuration, and all three have been featured rather frequently in the discography on that instrument. Finally, the E ♭-Major Concerto (RV 375) is in reality one of Vivaldi’s more interesting violin concertos, written in an attempt to accommodate the emerging galant style and yet remain true to his well-known personal compositional format. In several works, Vivaldi does indicate a “flautino,” which today seems inevitably performed on a piccolo but which was almost certainly a high sopranino recorder or, at the very least, some sort of flageolet. Steger only includes one of these works here, as this disc is not geared towards the conventional works. Given the plethora of recordings of these works, the music is quite well known. The notion of arrangement is also not really of too much discussion, given that instrumental designations in the Baroque were often quite fungible, as noted above. Therefore, the focus must be on the performance itself. 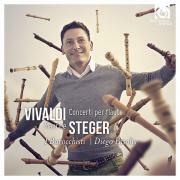 Recorder player Steger is, without a doubt, the most facile and flashiest performer on his instrument that I have heard in a long time. He seems to handle the often tortuous figuration and virtuoso roulades of Vivaldi’s music with studied ease. Some of these, however, threaten to derail, particularly in the fiendish opening movement of the Concerto in G Major’s first movement, the second movement of “La Notte,” or the opening of the violin concerto arrangement (RV 375). One has the image of a car careening down the hairpins of the Cote d’Azur ( à la Cary Grant) with one wheel often hanging over the edge of the cliff, dangling over the precipice momentarily before finding solid ground and whipping onwards down the tarmac. One cannot help holding this image in one’s mind in the faster movements, partially due to the tempos that Steger and conductor Diego Fasolis take. The old rule of thumb used to be: fast, faster, and breakneck speed. To this I would add after hearing this disc: bat out of hell. The result most often is a fiery and brilliant playing by Steger, whose dexterity should be the source of awe and wonder. But I also find that many of the nuances that Vivaldi inserts into his music, even the rapid solo portions, simply submerge into the glorious display. That is not to say that everything is run at high speed. The mysterious opening of the G-Minor Concerto “La Notte,” with a mysterious slow march at the beginning, is as effective as I’ve heard it played. And the fourth movement has the recorder floating ethereally above a soft, plucking continuo foundation, a mysterious preparation for the furiously-paced finale. The Barocchisti ensemble is nicely capable of following Steger’s pace, and there are moments of soft blend that contrast with the furious tempos. In the pastoral concerto the oboe provides a wonderfully playful foil, as does the rounded tone of the bassoon in the ensemble. I have mixed feelings about this disc. On one hand the playing is eye-popping in terms of its dexterity and brilliance, and certainly the ensemble is quite fine. On the other, I find that the subtleties of the music are often glossed over in favor of virtuosity, and despite the flexibility of instrumental designations, I am not totally convinced that the arrangements are viable in all cases (certainly the violin concerto is one of these). If you want something that will make you sit up and admire Steger’s obvious complete command of his instruments, you might be impressed here, but for those wishing for more attention to the subtle intricacies of Vivaldi, this probably won’t suit.